LOS ANGELES, August 30, 2012 –Findmypast.com, an international leader in online family history research, today announced a national partnership with Federation of Genealogical Societies (FGS) to preserve, digitize and provide access to local records from genealogical societies across the country. 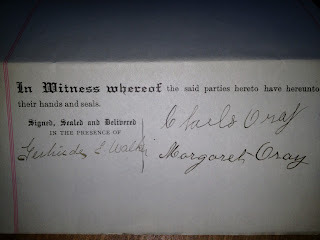 The records are a fantastic addition to a growing collection of US records on findmypast.com. FGS members who participate will reach new audiences as each society and their collection will be promoted by findmypast.com. 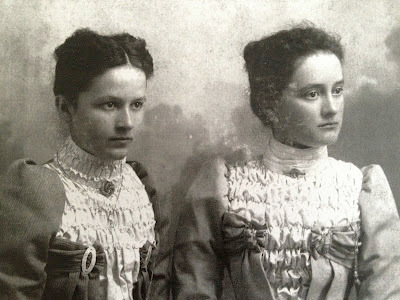 We know these are Facey sisters, daughters of Samuel Facey and his wife Margaret Wilford. But we aren't sure which daughters they are! Sam and Maggie had daughters Redgon born 1880, hubs' great grandmother Mary Louise, born 1882, Nellie born 1885, and Margaret Jane (aka Jenny) born 1900. Ancestry.ca is giving FREE ACCESS to ALL of the U.S. Census records (1790 - 1940) including the newly launched U.S. 1940's Census. You can also search these census records for free on Ancestry.com during this time period. From August 29th through September 3rd, Ancestry.com is opening all of its U.S. census records – FREE. You can also search these free records on Ancestry.ca during the same time period. The following promotion codes are valid 12:00 a.m.–11:59 p.m. Mountain Time (-6 GMT) on their respective dates when ordered on the Flip-Pal Mobile Scanner shop page. Not sure where or when you would use a Flip-Pal Mobile Scanner? See how I use mine - on the road, at home, on the couch, creating borders for photos, and more. I've scanned family photos and memoirs with my 87 year old auntie. I've taken it to archives, museums and libraries to scan documents, I've created pretty borders for treasured family photos - the list of what you can do with Flip-Pal Mobile Scanner is endless. Save $20 when you purchase a Flip-Pal Mobile Scanner plus a Deluxe Flip-Pal mobile scanner Carry Case with Pocket! Save $30 when you purchase of a Flip-Pal Mobile Scanner with Creative Suite Craft Edition DVD plus a Deluxe Flip-Pal mobile scanner Carry Case with Pocket! Save $40 when you purchase of a Flip-Pal Mobile Scanner with Digital Creativity Suite 3.0 DVD plus a Deluxe Flip-Pal mobile scanner Carry Case with Pocket! 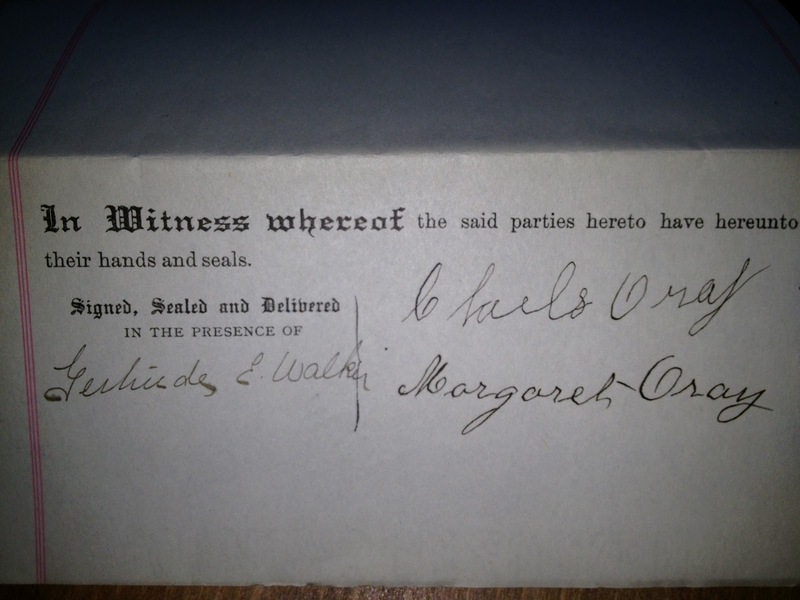 Details: Gertrude E. Walker, stenographer, Napanee, Lennox & Addington Co., takes oath that she witnessed signatures of Charles O'Ray, farmer, and his wife Margaret. More documents will follow as I scan them and extract their details. 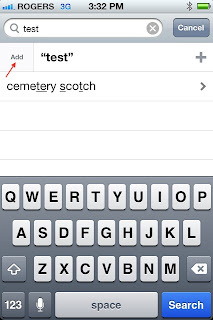 You may view all documents in this collection by clicking on Lennox-Addington Collection in right hand nav bar. My husband and I are very different genealogists. I love research. I love the challenge of the hunt, the mystery waiting to be solved. I'll research anyone's ancestry, it doesn't have to be mine. I just love solving the puzzle. 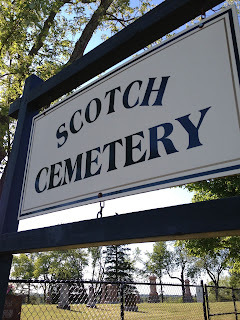 Of course I also love finding my own ancestors! Hubs however dislikes research. He finds it tedious and a lot of work. He loves finding an ancestor, or better yet, having someone else find that ancestor for him. He's passionate about his ancestry, but avoids the actual research whenever possible. Family lore is enough for him, he has no need to find sources to verify it. If it's important enough to him, he'll force himself to push through the research but he'd rather I did it for him. As he says, if he were rich, he'd hire someone to do all the research for him. 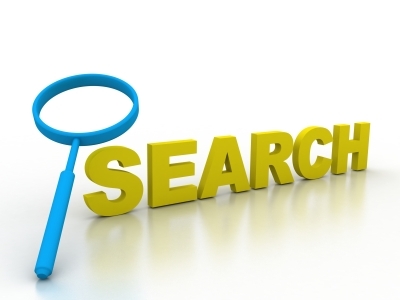 The Scholar: This genealogist lives and breathes source citations. Accuracy is everything to this research. You'll often find this person submitting articles to scholarly journals as the NYGBR. Page after page of red edit marks don't intimidate them, they'll plow through their article drafts, refining and revising and making each more accurate than the last. Some of us may fit more than one category. I am definitely a Hunter-Detective but I'm also a little bit of a Scholar. I don't live and breathe source citations but I have submitted articles to scholarly journals and I've faced the red editing pen with determination. I'm also an Analyzer. Hubs on the other hand is a Gatherer. He doesn't seem to fit any other categories. Family Tree DNA 3 Day Sale! At this time these are the only two options, and they are geared specifically for newcomers. This sale will end on Saturday, August 25, 2012 at 11:59PM. As with all promotions, orders need to be placed by the end of the sale and payment must be made by end of this sale. Many genealogists have been eagerly waiting to hear when Family Tree Maker 2013 will be released. Things a little different this year at Ancestry.com . Instead of creating a new version of the software, the team has been putting all of its resources into improving Family Tree Maker 2012 so you get new bonus features throughout the year. 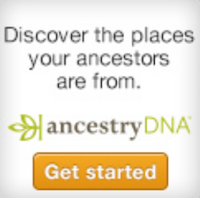 If you haven’t purchased or upgraded at Ancestry.com to Family Tree Maker 2012 yet, there’s never been a better time. Aren't family treasures wonderful? A few days ago hubs resurrected dozens of photos from the late 1800s, early 1900s that were found in his great aunt's house after her demise. He can identify many of the people, but there are dozens of photographs (I haven't counted them all yet) and probably half of those are of people not known to him. 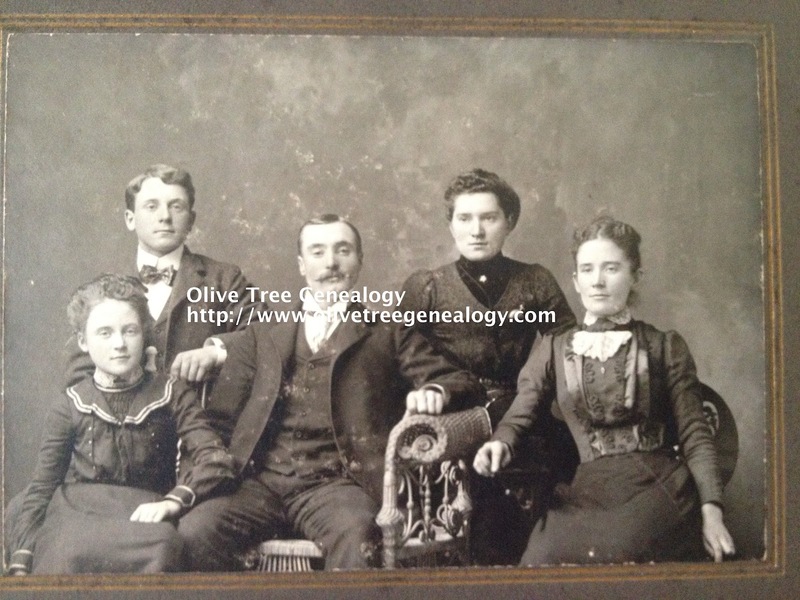 We'll start posting these photos here on Olive Tree Genealogy blog in hopes descendants will spot an ancestor. Please let us know if you do. 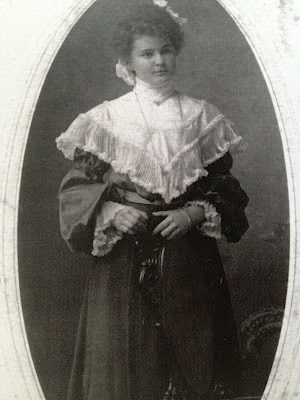 The great aunt who owned these photos was an Elgie from the St. Mary's Ontario area, whose mother was a Facey. 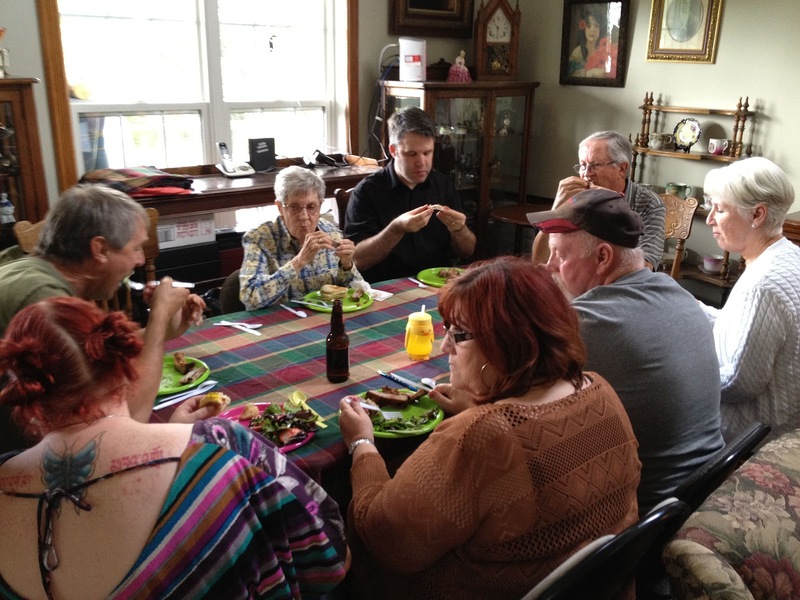 Extended family members in the photographs are from the Facey and Wilford families. 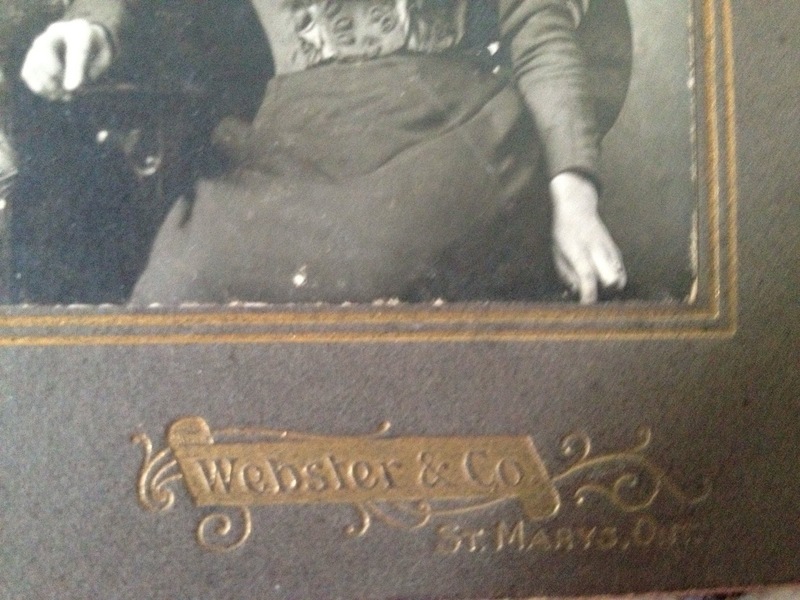 These two photos are of hubs' great-grandmother Mary Louise Facey. 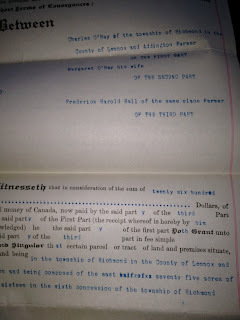 She was born in 1882 in W. Nissouri Township, Middlesex County Ontario to parents Samuel Facey and Margaret Wilford. Mary Louise married William Elgie and they settled in St. Mary's, Blanchard Township, Perth County. 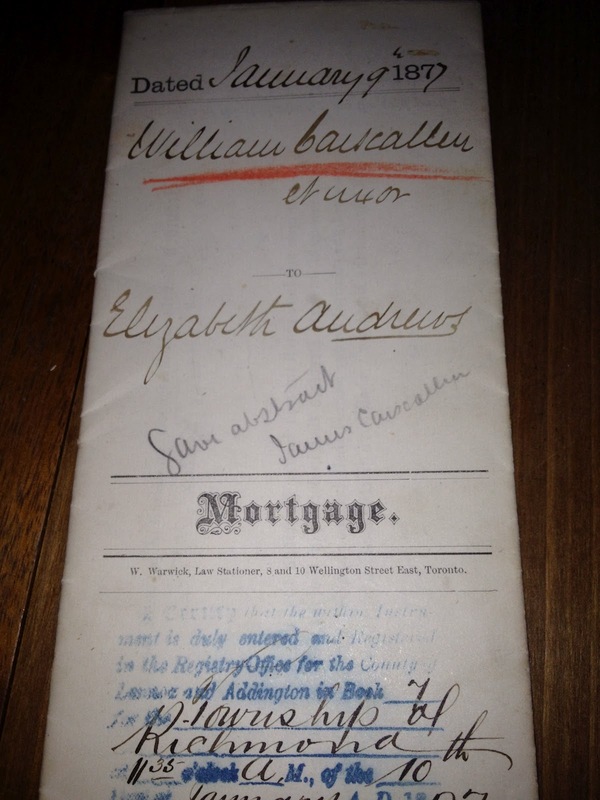 This document is a mortage dated 10 January 1877 between William Carscallen and Elizabeth Andrews. Details: William Carscallen of Richmond Township and Jane his wife. Elizabeth Andrews, wife of David, lumber merchant. Land in question: East 1/2 of East 3/4 of Lot 16, Concession 6, Richmond Township, Lennox & Addington Cos Ontario. More documents will follow as I scan them and extract their details. You may view all the documents in this collection by clicking on Lennox-Addington Collection in right hand nav bar. 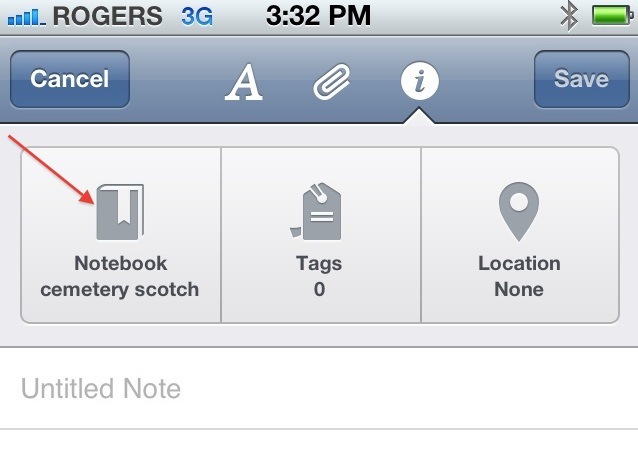 Evernote is something I can't live without. 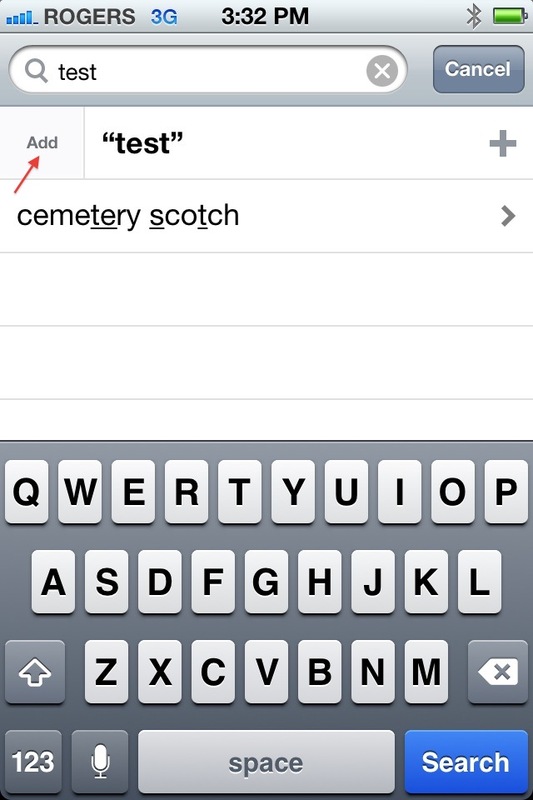 I use it daily, in fact, several times a day. I clip recipes I find online. 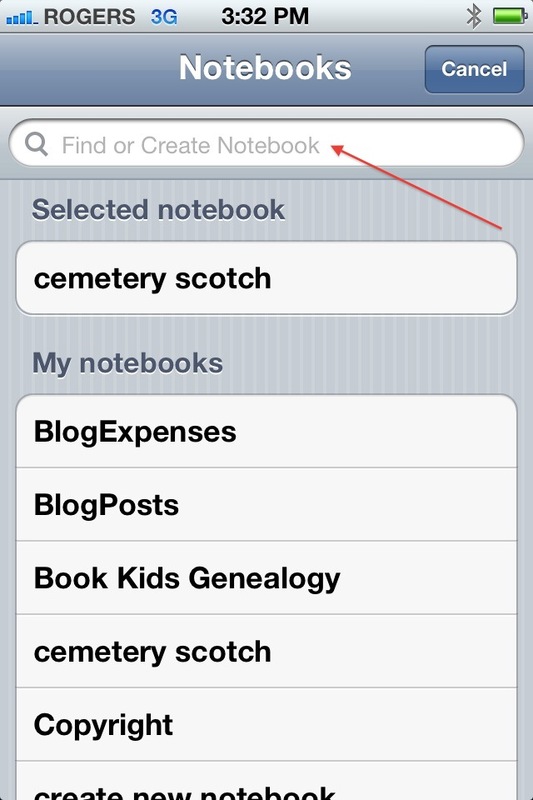 I use Evernote to save receipts for online purchases. I make point form notes of ideas for future genealogy blog posts. 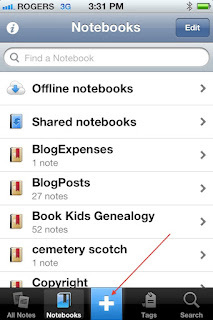 If you're familiar with Evernote you know it's easy to create a new notebook on your computer or laptop. Just click on FILE then in the dropdown menu you choose New Notebook. Simple! 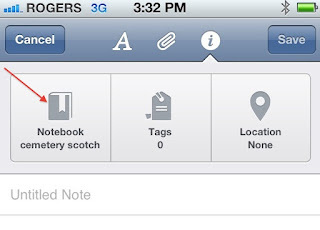 But I often use Evernote on my iPhone and frequently need to create a new notebook directly in the Evernote Mobile App. It's not easy! 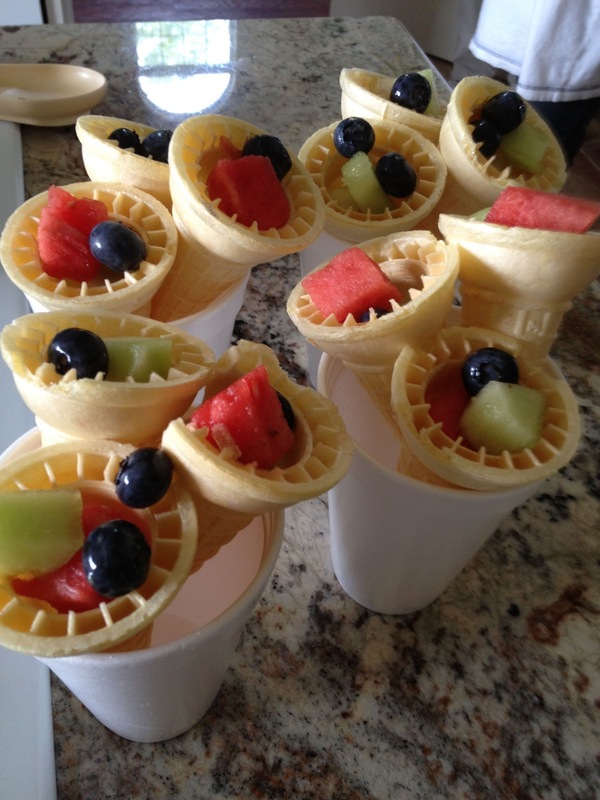 There's no selection that allows you to easily create one! 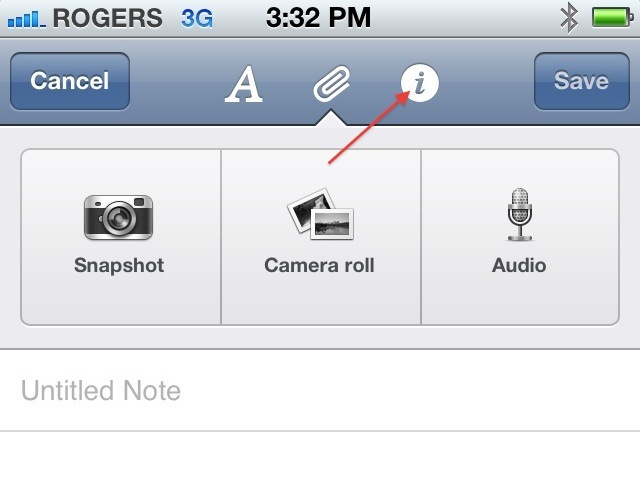 I've spent days trying to figure out how to do this on my iPhone using the Evernote mobile app. After finally figuring it out yesterday, I want to share the how-to with my readers. It's definitely not intuitive, it's rather confusing, it's certainly tedious and I hope the developers will create a simple icon choice for creating new notebooks in the mobile app. But meantime, here's how can you do it. 5. 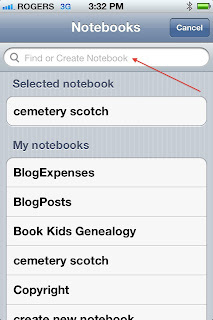 Type the name for your new notebook in the field that says "Find or Create a New Notebook"
6. 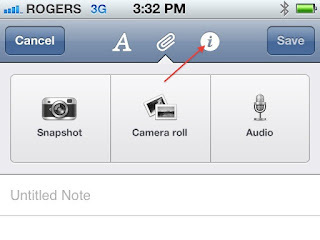 Your notebook name will pop up and beside it is an icon with the word "Add". Choose this then hit SAVE. 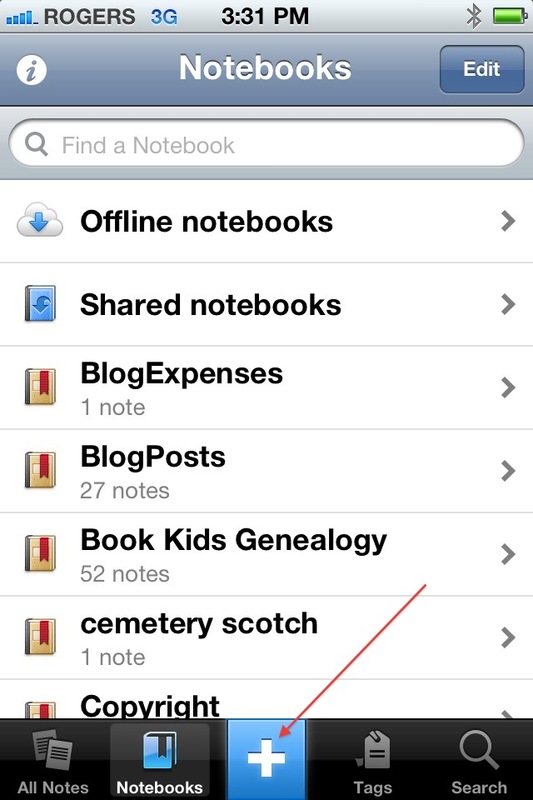 I'll be writing more tutorials on using Evernote over the next few weeks so watch for them here on Olive Tree Genealogy blog. PROVO, Utah, Aug. 17, 2012 (GLOBE NEWSWIRE) -- Ancestry.com Inc. (ACOM) today announced the completion of its acquisition of Archives.com, a leading family history website, for approximately $100 million in cash and assumed liabilities. "Archives.com is a great addition to the Ancestry.com family. It is a fast-growing business that has expanded the addressable family history market through a simple and affordable approach," said Tim Sullivan, President and Chief Executive Officer of Ancestry.com . "We are excited to increase our ability to help more individuals discover their family history." Archives.com was owned and operated by Inflection LLC, a Silicon Valley-based technology company. Since Archives.com's launch in January 2010, the site has rapidly grown to more than 440,000 paying subscribers who pay approximately $39.95 a year. Archives.com offers access to over 2.2 billion historical records, including birth records, obituaries, immigration and passenger lists, historical newspapers, as well as U.S. and U.K. Censuses. Ancestry.com plans to operate Archives.com separately, retaining its brand and website. Many Inflection employees, including key marketing, product and engineering executives, will join the Ancestry.com team. Did you know that with each generation your number of ancestors doubles? For example you have 2 parents, 4 (2x2) grandparents, 8 (4x2) great-grandparents, 16 (8x2) 2nd great grandparents and so on. By the time you reach your 7th great-grandparents you will have a total of 1,024 ancestors. Phew! Now that doesn't mean these are all unique individuals, in fact is is almost certain that you will find cousins marrying cousins, perhaps uncles marrying nieces as you go further back. That means that even though we all have 1,024 ancestors at this point in our family tree, there are probably duplicates. See Pyramid vs Diamond Theory of Ancestry for more on this fascinating topic, but I want to talk about something different in this blog post. Recently my friend Lisa B. Lee of GotGenealogy posted on her Facebook Status that of the 1,024 possible ancestors in her family tree (going back 10 generations to her 7th great-grandparents) she has only found 77. That's 7.5%. Now Lisa is not a novice at genealogy research. 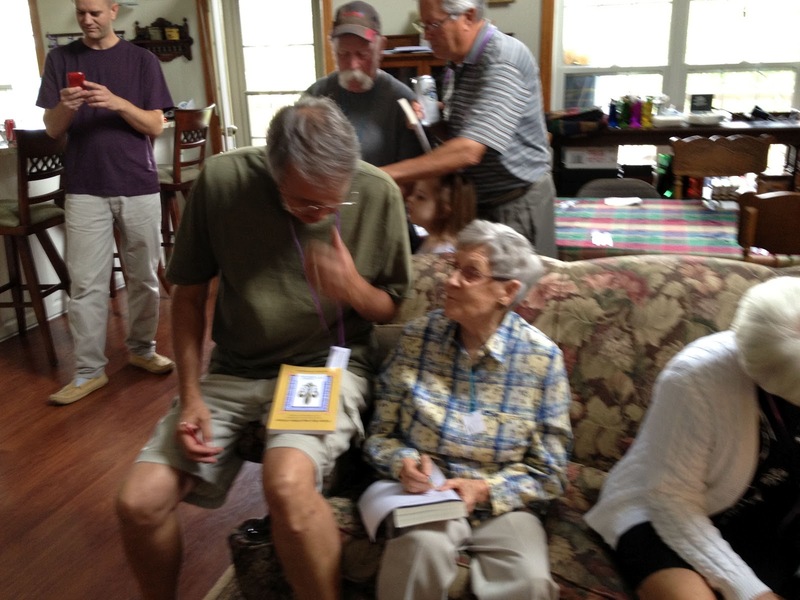 She's a very good genealogist and has been researching for many years. But the number not found surprised her! I was intrigued but before I could figure out my own numbers, I happened to read Crista Cowan's blog post called "Family History All Done? What's Your Number?" on the Ancestry.com newsletter. Crista also figured out how many ancestors she has found so far, again going back the same 10 generations. Before I tell you the numbers remember that Crista is an experienced professional genealogist. She knows what she's doing! Well Crista's total number out of 1,024 was 365. That's 36% Crista still has 64% not yet found. Out of 1024 possible ancestors I have found 295 for a total of 29%. What a surprise and yes, a shock! I knew I was stuck on my Irish ancestors. I knew I could only get back to my 2nd great grandparents on several of those ancestors from Ireland but I had no idea I had so many not found. I'm doing okay with my family tree until I hit my 4th great grandparents. That takes me back to about 1800 so I've pretty much got my family tree covered for the last 200 years. After that it gets sketchy! Not having a high percentage of found ancestors is obviously not related to how experienced a genealogist you are or how long you've been researching, so there's no shame attached to a low number. It's just an interesting exercise that points out that genealogy research is never done! And that's what makes genealogy so much fun and so addictive. There's always something more to find. And now if you'll excuse me I'm off to find my missing 71%! Rumour Mill: Who Do You Think You Are? New Season Coming to a New Network? "WHO DO YOU THINK YOU ARE?" on DVD ! And Season 3 coming soon. Look for an all new season in 2013!!! on an all new network! But what I'm excited about is the teaser about an all new season in 2013! I haven't been able to find out any more details but will let my readers know as soon as I do. Labels: Announcements, WDYTYA, Who Do You Think You Are? Hubs took several photos of tombstones which I've made into a video and uploaded on Olive Tree Genealogy YouTube Channel. It is only a partial viewing of the cemetery as there are many more gravestones in it. This Deed of Land is in the name of Geo (George) Carscallen. It consists of an Oath by Walter Scott Williams of Napanee stating that he witnessed Alexander Williamson Carscallen sign an Instrument. Date is May 1873. 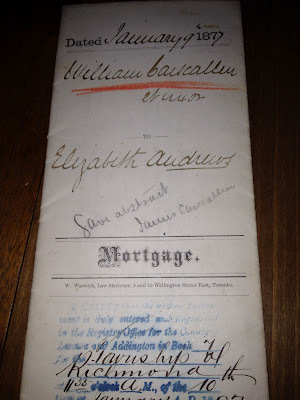 Lastly is an Indenture dated 11 Jan 1872 between George Carscallen and Alexander, Thomas, James, Craig Luke, Edward and Metcalf Carscallen. Also named are Elizabeth wife of George Carscallen, Emily, wife of James and Ann wife of Craig Luke. There are many details and the signatures of all involved. 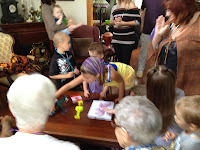 Family Fun Day in Pouring Rain - Yes it Can Be Done! 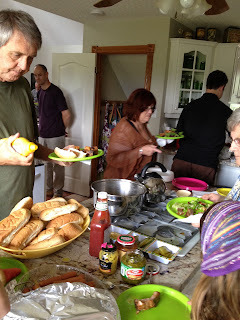 Well, our annual Family Fun Day (aka Family Reunion) was this past Saturday. It poured rain almost all day so I had to hold it inside our house. That called for some last minute revisions of games, events and the meal! But guess what? As horrifying as it first was to figure out how 30 people were going to fit into our home, and be entertained, and fed at tables (I don't like people eating on couches and antique chairs), it worked! I still had everyone wear an ancestor name tag and find their matching ancestor spouse for a partner for the games. Then I placed the 10 objects on the coffee table and gave a 2 minute time period to study and memorize them. I learned the hard way that 2 minutes is way too long as almost every team got it right at the end. In future I'd give a one minute time limit or more objects. After they studied the objects we covered them and handed out a 10 question multiple choice quiz. This was funny because the questions were all about my husband and I! So whoever knew us best would score well. I noticed a lot of cheating going on (One of the grandchildren called it research, not cheating) with folks looking at other people's questions for answers. After the quiz was done, we had a 10 question oral math round. As a former teacher I should have known better, but I told the teams to yell out their answers and first team with right answer would get one point. Big mistake. Because I made the questions super easy, there were many simultaneous shouts of answers and it became impossible to know who said it first. But it made for a lot of laughter. And really it wasn't very fair as I taught Math in High School and guess what both my sons are amazing at? Yep - Math. So I kind of figured they'd score well for their teams and they did, with the most points. Good thing my daughter was late arriving or she'd have been a strong contender because she too is a math whiz. Anyway it was fun but we had a tie between the two teams both my sons were on. I had to come up with a quick tie breaker so I played one song from my iPhone and whoever got the name of the song and the artist would win. I chose Stereo Hearts by Adam Levine and Gym Class Heroes so that made it tricky as they both kept guessing Maroon 5 as the group! Cheating almost won the day as one team tried to Shazam the song using their iPhone for the answer. Seating for the meal was fine - we brought up portable tables and a card table, and used the mudroom, dining room, living room and entertainment room to set places. No one complained so I think it went well. All in all a good time was had and the last family member left at 9 pm (it started at 1 pm). And yes I'll do it again next year even though I was exhausted and sore and aching everywhere by the time it was over. But that's okay as I rested up all day on Sunday. I'm already planning the 2013 Family Fun Day. This is the second photo in our collection of rescued photographs of the Hooper and Squires families of St. Mary's Ontario Canada. We know that the young boy standing is Edgar Hooper and seated are his father John Hooper and mother Kezia Perkins. Given Edgar's birth year we estimate the photo was taken no later than 1907. Edgar had a sister Edith born in 1889 so perhaps this is the young woman standing behind John and Keziah. Ella, another sister, was born in 1898 so it is possible she is the younger girl. However we are missing other children - Eva born 1895 and Milton born 1892. Flip-Pal Mobile Scanner Coupons Just Keep on Coming! Flip-Pal Mobile Scanner just keeps on giving genealogists great deals! The following promotion codes are valid 12:00 a.m.–11:59 p.m. Mountain Time (-6 GMT) on their respective dates when ordered on our shop page. Save 10% on all Flip-Pal Mobile Scannerr accessories—minimum $50 order! Save $50 when you purchase a Flip-Pal Mobile Scanner with Digital Creativity Suite 3.0 DVD plus a Deluxe Flip-Pal mobile scanner Carry Case with Pocket and a Picture Keeper PK8! As many of my readers know, I host an annual Family Fun Day (aka Family Reunion). 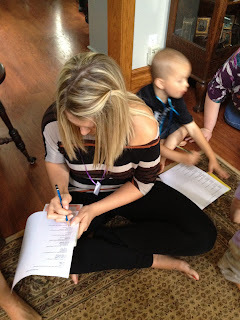 I have games and team activities and I try to incorporate some genealogy in there too! Every year I try to come up with a new idea for the team activities. This year was tough and I honestly didn't know how or if I could top last year's Amazing Genealogy Race. Well, I definitely haven't topped it but I have a new idea for this year. First, each friend or family member will be given a card to hang around their neck. The card has a name of an ancestor and the instructions "Find your ancestor spouse. He or she will be your partner in the team activities"
So for example one card is the name of my ancestor Cornelis Van Slyke. Whoever gets that card must go around and talk to everyone to find out who is wearing the spouse card of his Mohawk wife Ots-Toch. I do this to encourage folks to meet newcomers, and also to do a little family tree brainwashing. There are charts with pedigrees which I put up for those who don't know all the ancestors - which sad to say is most of my family! The activities this year are few and they are simple, but I think they'll be fun. After partners find each other, the games begin. They must first go to our storage shed where they will find 10 objects on a table. Their job is to memorize the objects. They can't take a picture with their smartphone or camera. They can't write down what is on the table. It's all memorization. I'll have some everyday objects such as a spoon, an egg, a guinea feather, a ruler. But I will also have some Ancestor Cards with a photo of an ancestor plus their name. Whenever a team thinks they have the objects memorized they must race off to the first of four events. These events are easy, for example one is to toss a frisbie through a hanging hula hoop. The goal is to break the team members' concentration and make it harder for them to remember the ten objects. The last event is a fun one - they must go to our pig field, toss a scoopful of food over and yell out "Piggy Wiggly Oinky Oink oink" to call the pigs. Then they count them (and remember how many they counted!) The goal of this event is to make hubs and I laugh. We plan to video folks as they do their silly call. Then and only then do the teams race to the Pit Stop where they will find pencil and paper waiting. They write down the 10 objects plus the total number of pigs and give it to me. If they're wrong, back they go! First team to get it right wins the prize. What do you think? Will everyone have fun? One was the Declaration of James Carscallen (on left). It begins with "I, James Carscallen, of Napanee, Co. of Lennox & Addington, manufacturer..." and continues with the statement that he is the son of Edward R. Carscallen who died December 1871. The declaration states that Edward Carscallen had 8 sons: George, Alexander Williamson, Thomas, Craig Luke, Edward, Metcalf, William and James. James' declaration also states that in January 1872 the East 1/2 of Lot 16, Concession 6, Richmond Township, was conveyed to William Carscallen. 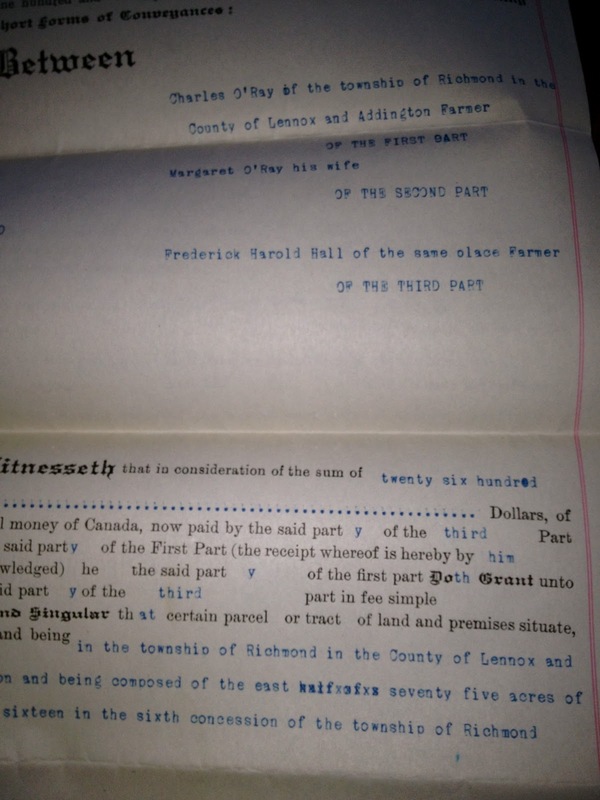 There is much more detail in the document as to what has happened to the land and why he is offering his declaration. 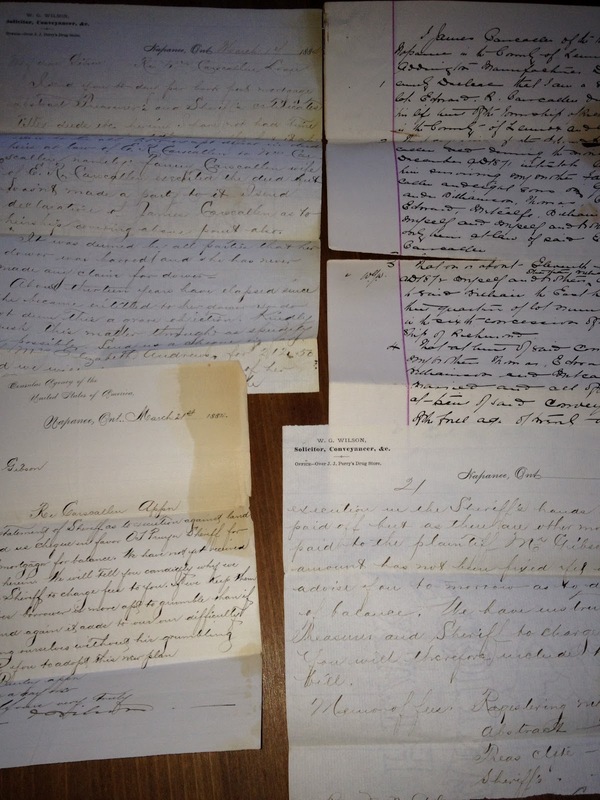 A two-page letter dated March 14, 1884 from W. G. Wilson, Soliciter addressed to "My dear Gibson" was also in this bundle. 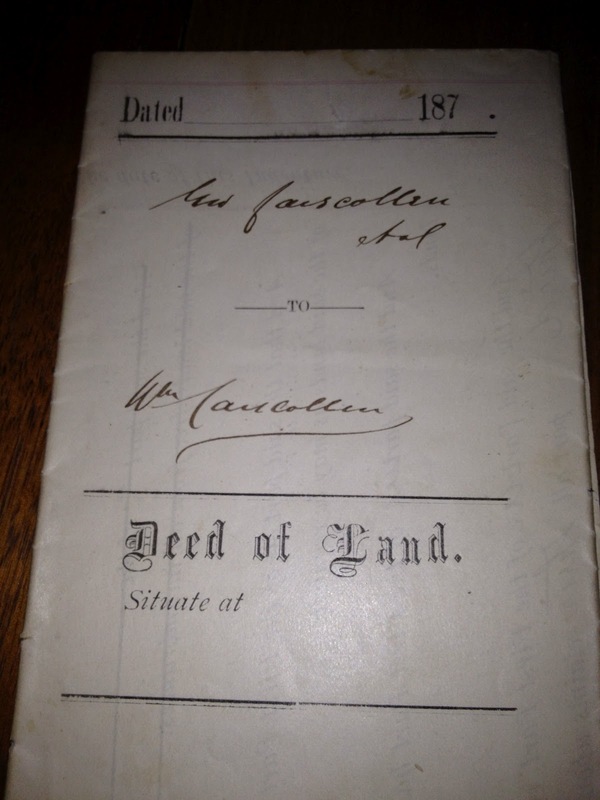 It is regarding the lease of land to William Carscallen. The letter names heirs of E. R. Carscallen, namely Fanny, his wife, and a son James. A Mrs. Elizabeth Andrews is also mentioned along with a request for money to be sent to her. A scribbled notation in the margin adds "she is an old lady about 80"
The last paper in this bundle is dated March 21, 1884 and is on letterhead of W. S. Williams, US Consular Agent. 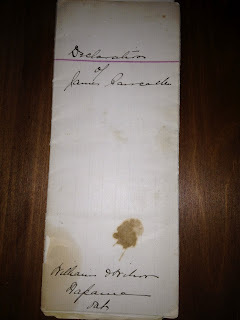 It is addressed to Robison, O'Brien & Gibson, Barristers, Toronto Ontario. It is in regard to the execution against the land in William Carscallen's name. Research on the Carscallen family on Ancestry.com reveals a great deal of information about them. 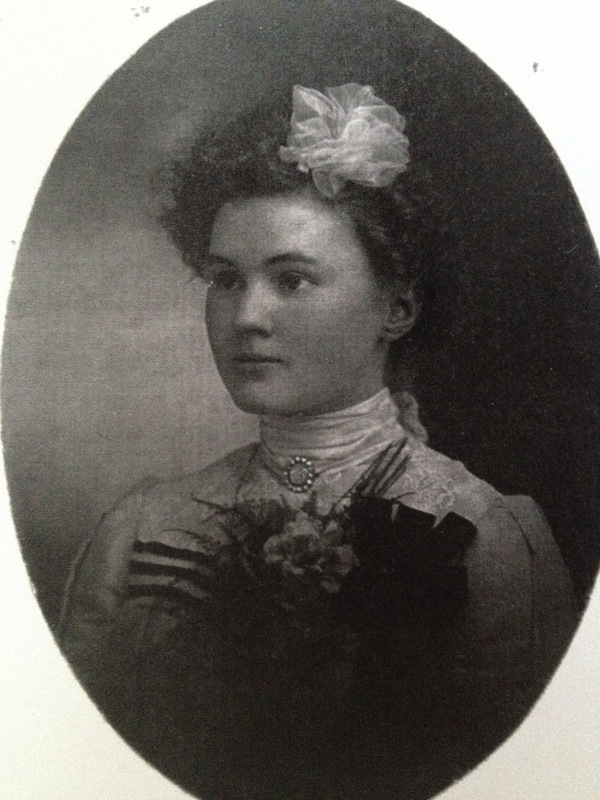 Edward Riggs Carscallen married Frances (Fanny) Moss and lived in Richmond Twp, Lennox & Addington Co. Ontario. He is found on the 1851 census living beside Rebecca Parks and her sons. In the 1851 census for Richmond only 7 sons are listed (Craig Luke is missing) but living with the family is an Elizabeth Gill age 7. She is continues to be found with Edward Carscallen in the census records for 1861 and 1871, and is noted as a family member. Just reminding everyone about the Flip-Pal Mobile Scanner coupons, good until the end of September.